Last week on the Startup Britain blog we announced the launch of the 123 Reg free online business training. To whet your appetite here’s some exclusive advice to turn more of your website visitors into customers. In part 1 we’ll look at visual elements; part 2 (next week) will focus on the copy. As business owners we love to see plenty of visitors on our websites. But as a Key Performance Indicator, “website traffic” is worth nothing unless your visitors do something whilst they’re there. We want visitors to leave their details. Or buy something. Yet so few do. For most sites, 98% of visitors never do either. Understanding this, and then removing the barriers, is called Conversion Rate Optimisation (CRO). CRO is about understanding what your visitors want to do, and making it easy for them to do it. So what can you do to turn more browsers into buyers? In the planning stages, I bet your website was simple. You had a brand, a service or a product. And you wanted to market it online. Since then you’ve had new ideas. Friends, colleagues, and suppliers have told you how to change your site. You’ve added words, images, and pages. Your original site has grown from simple to complex. CRO sweeps this complexity away using the theory of KISS: Keep It Simple, Stupid! The KISS principle states stuff works best if it’s simple; complexity must be avoided at all costs. Therefore simplicity should be a key goal in design. 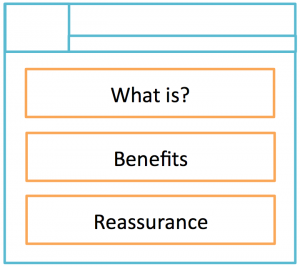 Do you know what your website objective is? It’s worth sitting down and working this out. If you sell online then the objective is to sell as many units as possible, at the right price. If you want people to visit your shop then the objective is to make it easy for people to find you. If you have a blog the objective is to engage your visitors and get them to share your content with others. Once you’ve worked out your website objective you need to give each page objective. 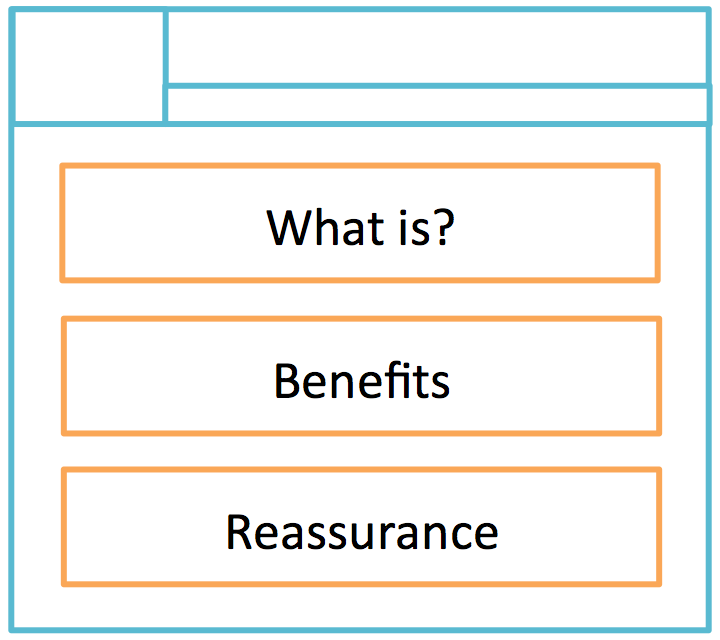 A homepage objective might be to help people find the right product. A product page objective might be to make that product easy to buy. A blog post objective might be to keep the reader onsite for more than a minute. Its important to work out your page objective and your website objective because you need to give them all a priority. Knowing the priority helps you decide what to make stand out on your site. So how can you tell if visitors are ‘getting’ your priority? We can learn a lot from a site that has apparently has no priority. 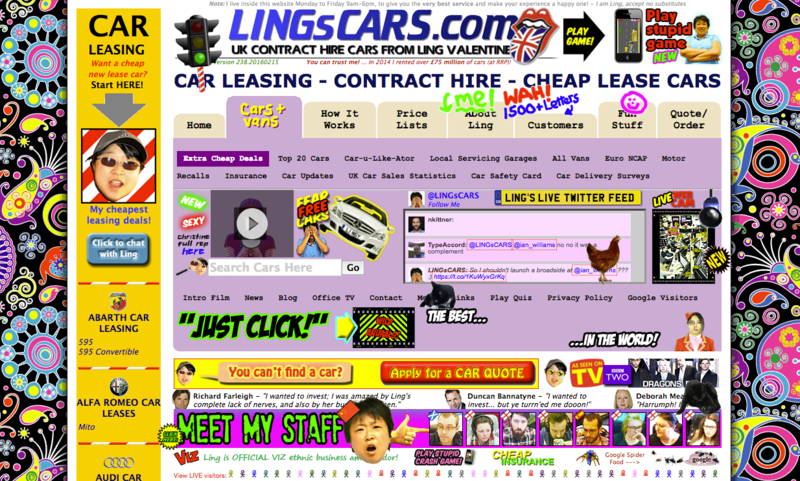 Lingscars.com is a confusion of messages. As a user its hard to work out how what Ling wants you to do. Of course in this case it’s actually quite deliberate. But this strategy is unlikely to work for your website. There’s an easy test you can do on your own site to see if your priority is being clearly communicated. It’s called the squint test. Squint at your website until you can’t read anything any more. Then try to see what stands out. The stuff that stands out should be the main priority of the page. If you’re trying to get leads then it should be a form with a submit button. If it’s a product then it should be the image, description and a call-to-action. Squinting reduces the page to its bare essentials. It should reveal the visual hierarchy and focal point. 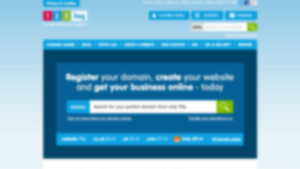 A blurred version of the 123 Reg website. Have we given priority to the page objective? So try squinting at your site and see if it makes the grade. If it’s unclear your page doesn’t have a clear priority. So try making it simpler. Its important to put information in the right order on your website. This is called the Content Hierarchy. Think about the actions a user takes on their way to buying a product. 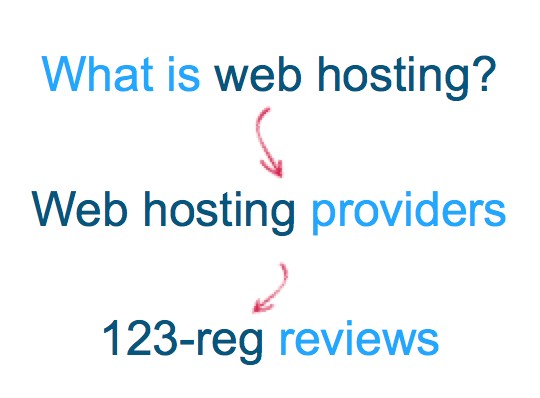 Lets use ‘web hosting’ as an example. Someone might well start on Google with a ‘what is’ search. 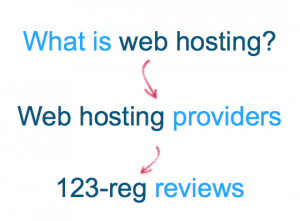 Having read about hosting and understood the options they might well look for a company selling it. If they end up on 123 Reg, there’s a good chance they’ll check out whether we’re a good brand to do business with by searching for our reviews. When it comes to laying out the content of your web page you need to guide users through this same journey. At the top of the page answer their ‘what is’ question. Imagine they know nothing about what you do. Then give them benefits about what you do. This is the bit that sells your products and services, tells visitors the difference you will make to their lives. Lower down; reassure them that you’re a good choice. We’ll talk about that a bit later. Its vital that your website follows the rules for website design, and is consistent with other websites on the Internet. Don’t force people to learn a new technique in order to navigate around your website. And it’s also key that every page on your site has a consistent design. You want users to be able to easily move from page to page with a smooth experience. You need to go easy on the colours: no more than four, and make sure they’re in the same place on every page. Keeping a menu, header and footer that are the same on every page. Consistency leads to a fast, frictionless navigation between pages. Users have to think less. And that usually makes them happier. A call to action (CTA) is written as text on a button that performs that task. Its usually ‘find out more’ or ‘buy now’: a clear command telling the user what you want them to do next. The problem with most websites is that they use CTAs to ask visitors to do too many different things. The risk is that visitors may end up doing nothing at all. This comes back to understanding the page objective, and then controlling how prominent each CTA is. For example, a ‘buy now’ button should be more prominent than a ‘more info’, because buying a product is what you really want the visitor to do. So how can you give prominence to a CTA? Make it big. Large buttons are easy to see. Make it green. Colour psychology tells us the green means ‘go’ and safety’. Make it directional. Tell the user what will happen when they click. Use ‘pay’ rather than ‘next’. Surround it with white space. It’s simply easier to see. Remember the lower part of the page hierarchy? That’s the place to reassure visitors: to tell them that you’re reliable. Endorsements and awards from know authorities like magazines. Give these prominence; they count for a lot. Well known clients. If you’ve got a known brand on the books, they make browsers comfortable that your service can be trusted. Payment symbols. They mean nothing but tests show they build trust. Well known suppliers. Even though anyone can buy from a well-known brand, their presence helps foster familiarity.